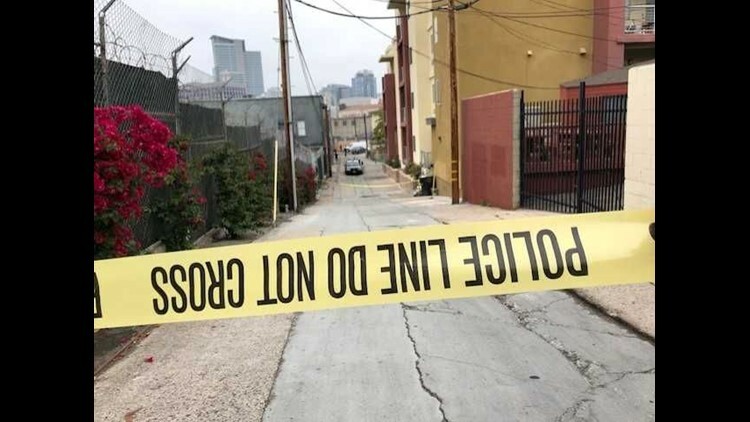 San Diego Police received a 911 call, 6:30 Tuesday morning regarding a male who was down in the 1600 block of Logan Ave.
SAN DIEGO (CNS/NEWS 8) - A 50-year-old homeless man was found dead Tuesday morning in a Barrio Logan alley, prompting homicide detectives to launch an investigation into what is at least the fourth shooting since Sunday afternoon within a several-mile radius in neighborhoods southeast of downtown San Diego. Maurice William Daniels was found just blocks from where five people were injured in a shooting spree Monday night in downtown San Diego's East Village, though police did not say if the incidents may be related. A 911 caller reported finding the victim at 6:34 a.m. Tuesday in the south alley of 1600 Logan Ave., San Diego police homicide Lt. Matt Dobbs said. Responding officers found the man not breathing on the ground in the alley with "visible trauma to his upper torso," he said. Paramedics administered emergency medical aid, but he was pronounced dead at the scene at 6:56 a.m.
Daniels was a transient who frequented the area where his body was found, and was possibly seen in that area with a woman about 11:30 p.m. Monday. The alley where the body was found is roughly five blocks south of the street corner in East Village where two assailants shot and wounded four people just after 11 p.m. Monday. Police say they do not know of any links between the recent spate of violence. Anyone with information about the homeless man found dead Tuesday morning in Barrio Logan was urged to call the SDPD homicide unit at (619) 531- 2293 or San Diego County Crime Stoppers' anonymous tip line at (888) 580-8477.